How much faith do you need to move the mountains in your life? What are the requirements to activate your faith ? Doubt,Fear and unbelief are faith killers. “And when they had come to the multitude, a man came to Him, kneeling down to Him and saying, “Lord, have mercy on my son, for he is an epileptic and suffers severely; for he often falls into the fire and often into the water. So I brought him to Your disciples, but they could not cure him.” Then Jesus answered and said, “O faithless and perverse generation, how long shall I be with you? How long shall I bear with you? Bring him here to Me.” And Jesus rebuked the demon, and it came out of him; and the child was cured from that very hour. Then the disciples came to Jesus privately and said, “Why could we not cast it out?” So Jesus said to them, “Because of your unbelief; for assuredly, I say to you, if you have faith as a mustard seed, you will say to this mountain, ‘Move from here to there,’ and it will move; and nothing will be impossible for you. However, this kind does not go out except by prayer and fasting.”(Matthew 17:14‭-‬21). “So why do you worry about clothing? Consider the lilies of the field, how they grow: they neither toil nor spin; and yet I say to you that even Solomon in all his glory was not arrayed like one of these. Now if God so clothes the grass of the field, which today is, and tomorrow is thrown into the oven, will He not much more clothe you, O you of little faith? “Therefore do not worry, saying, ‘What shall we eat?’ or ‘What shall we drink?’ or ‘What shall we wear?’ For after all these things the Gentiles seek. For your heavenly Father knows that you need all these things. But seek first the kingdom of God and His righteousness, and all these things shall be added to you. Therefore do not worry about tomorrow, for tomorrow will worry about its own things. Sufficient for the day is its own trouble”, (Matthew 6:28‭-‬34). “Now in the fourth watch of the night Jesus went to them, walking on the sea. And when the disciples saw Him walking on the sea, they were troubled, saying, “It is a ghost!” And they cried out for fear. But immediately Jesus spoke to them, saying, “Be of good cheer! It is I; do not be afraid.” And Peter answered Him and said, “Lord, if it is You, command me to come to You on the water.” So He said, “Come.” And when Peter had come down out of the boat, he walked on the water to go to Jesus. But when he saw that the wind was boisterous, he was afraid; and beginning to sink he cried out, saying, “Lord, save me!” And immediately Jesus stretched out His hand and caught him, and said to him, “O you of little faith, why did you doubt?”(Matthew 14:25‭-‬31). “Now when He got into a boat, His disciples followed Him. And suddenly a great tempest arose on the sea, so that the boat was covered with the waves. But He was asleep. Then His disciples came to Him and awoke Him, saying, “Lord, save us! We are perishing!” But He said to them, “Why are you fearful, O you of little faith?” Then He arose and rebuked the winds and the sea, and there was a great calm”, (Matthew 8:23‭-‬26). This entry was posted in Daily Message and tagged faith killers, get rid of unbelief and your faith will move mountains. ← GOD SAID IT,I BELIEVE IT,THAT SETTLES IT. 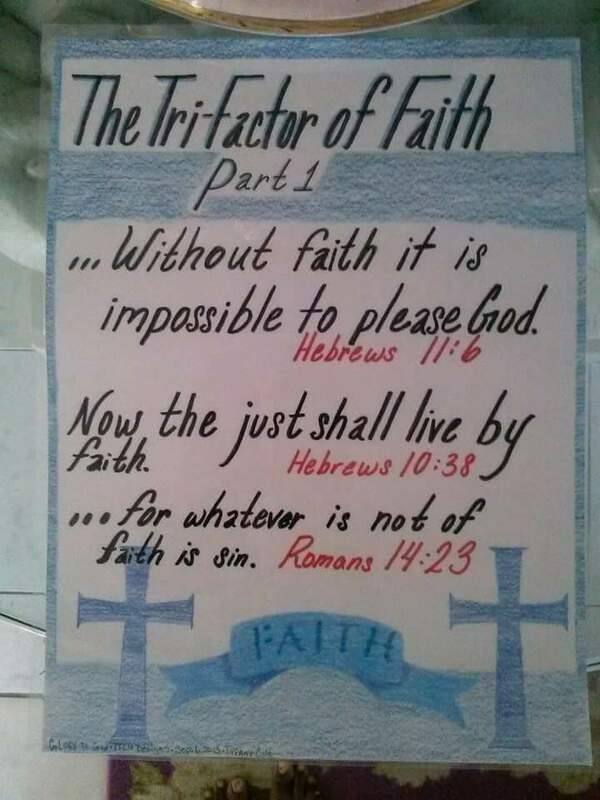 Praise the Lord for the Tri-Factor FAITH!! !